South Queensferry High Street looking eastwards. 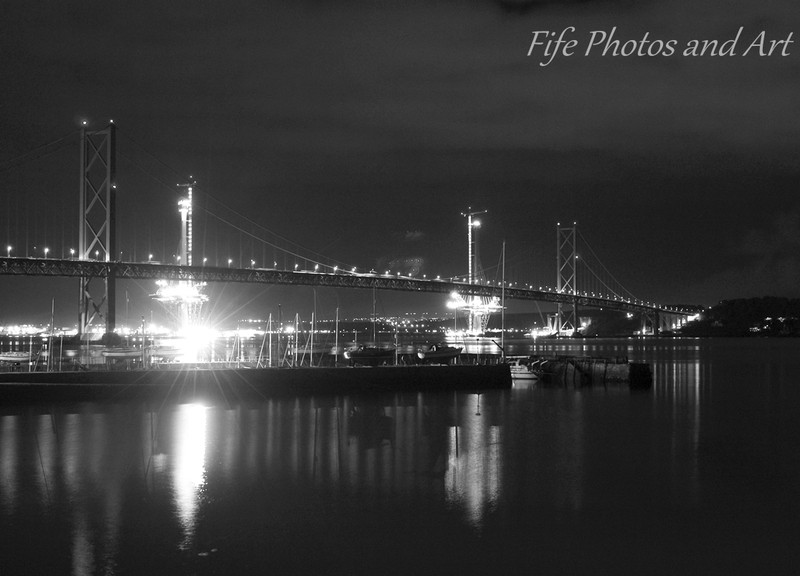 Forth Rail Bridge at night from South Queensferrry – monochrome image. Forth Rail Bridge southern end, with Hawes Pier lit up on right hand side. Forth Rail Bridge at night from South Queensferrry. The photos below, of the Forth Road Bridge, also show the new bridge in the background, with the main vertical support columns highly lit up at night. I think they are now working on the new Forth Road Bridge 24 hours a day. Forth Road Bridge at night from South Queensferrry, with harbour in foreground. Forth Old and New Road Bridge at night from South Queensferrry. The new bridge is still being built, hence all the lights. South Queensferry from Newhalls Road. Forth Road Bridge in background. 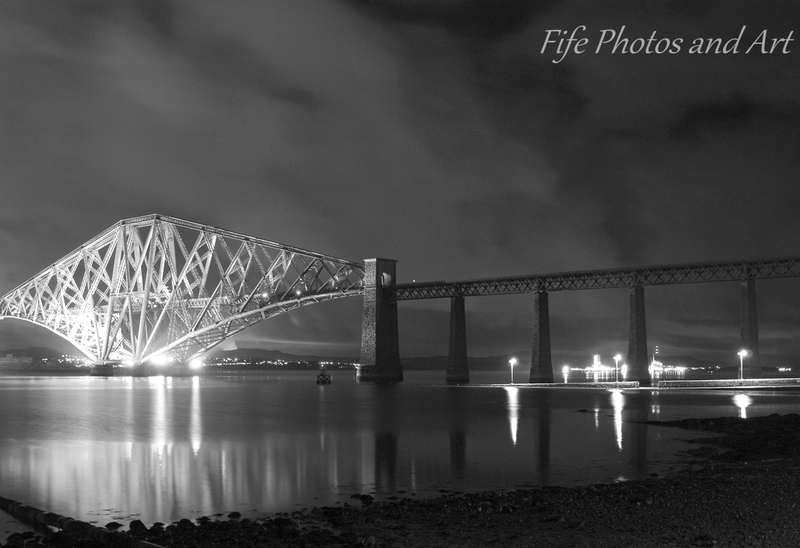 This entry was posted in Architecture, Fine Art Photography and tagged black & white photography, bridges, Firth of Forth, Forth Rail Bridge, Forth Road Bridge, night photography, Scotland, South Queensferry, West Lothian. Bookmark the permalink. Mysterious night photos! You feel the atmosphere of night, when everything turns to be black! Excellent! Thanks Ann 🙂 Old places do seem more atmospheric at night time. Gorgeous photographs. You’ve handled the lighting conditions perfectly. The rail bridge shots are my favourites. I’m keen to see what the new bridge looks like completed. I saw it being erected over the summer. Stunning photos. 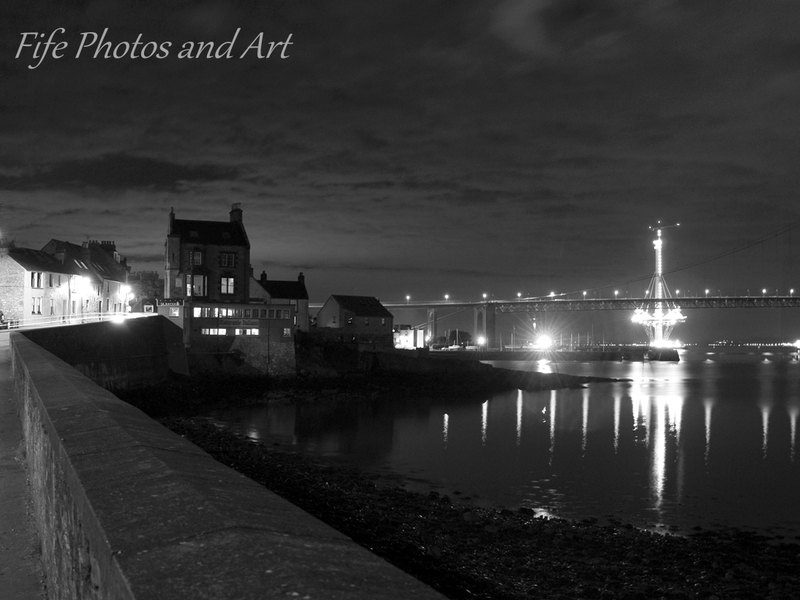 It is quite an experience walking around S Queensferry at dusk just as the lights are coming to life around the bridge. Magical! Thank you Diana 🙂 I’m pleased you liked the photos, it is a beautiful wee town. 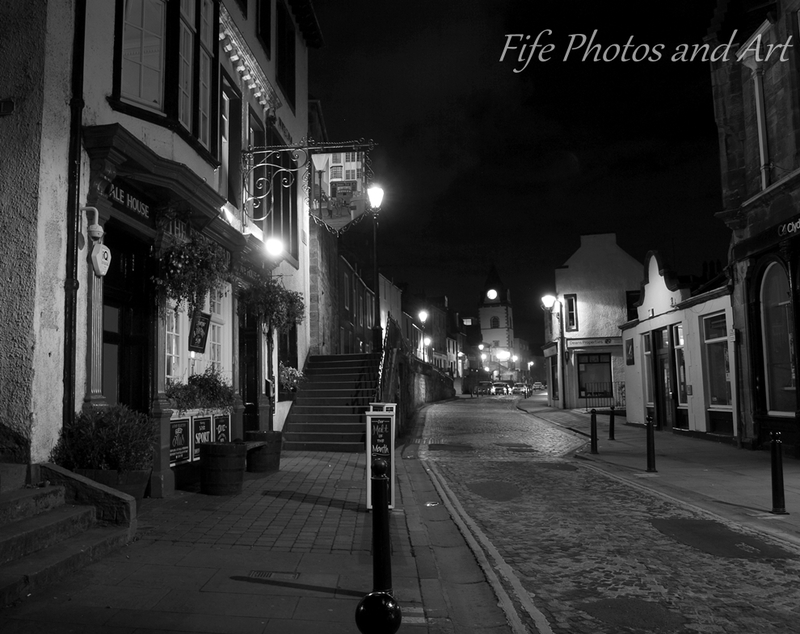 I really like the olde worlde look of the first photo: South Queensferry High Street looking west. Wonderful photos of the bridges, too, with the reflected lights. You certainly made good use of your short stop. Thanks Millie 🙂 I was pleased with how the first photo came out, it almost looked like Dicken’s’s London rather than Scotland (if you ignore the cars!!). I liked the second photo, too, with the houses above the shops. It’s unusual to see front doors at that level. It’s usually flats, or rooms belonging to the shops, up there. By the way, how did you get that one really bright phot of the rail bridge? It was in great contrast to the other photos. Sometimes cities can look a bit creepy at night like in your first picture. I think black and white only enhances that especially if there is fog. Great pictures. Thank you Debi 🙂 Glad you like them so much. The two bridges (s00n to be three) are very grand in daylight, but the night photos adds a sense of drama to them. Thank you Lorna 🙂 Both the Queensferry’s are great places for photography as you will know, but I think South Queensferry edges it on the beauty side of things 🙂 I was really pleased with how the first photo came out, I was lucky to not have many cars in it, or people on smart phones, which allows it to have an almost Victorian feel to it. That’s exactly what it has, a Victorian feel. Very effective use of black and white! Lovely shots. 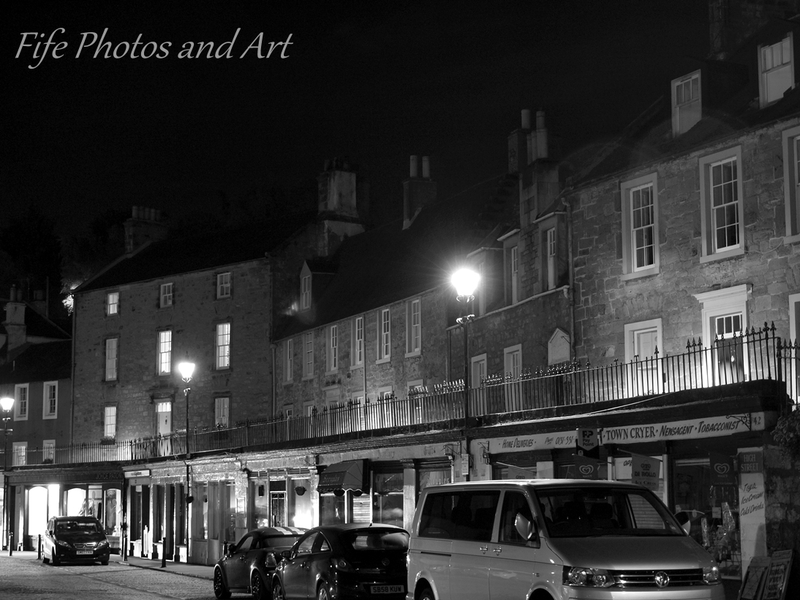 Great pics, Andy, especially the one looking up the deserted street – somehow quite spooky and serene at the same time. Thank you Jo 🙂 I was lucky, after a few minutes waiting, I managed to catch the shot with almost no cars, that improved the general atmosphere of the photo! Don’t the bridges look great at night? And the first photo has a lot of interesting subjects. I like the monochrome look for that one. Love your night photography. Quite dramatic. I love the monochrome work. Thanks for sharing. Both North and South Q. are favourite places. Where I grew up (near Polmont Station) I could hear/feel the piles being driven in for the 51 year old road bridge. Your photos have a particular significance now. Thanks for these great shots. Your very welcome 🙂 The photos certainly do, with the bridge being shut. I feel really sorry for all the people who use the bridge to commute in and out of Edinburgh, it must be a nightmare to go around to the Kincardine Bridges twice a day.